The day was celebrated with a series of befitting programme. Human chain was formed by the students and teachers at the main gate of the vidyalaya. Everyone offered flowers at the feet of the portrait of Swami Vivekananda. 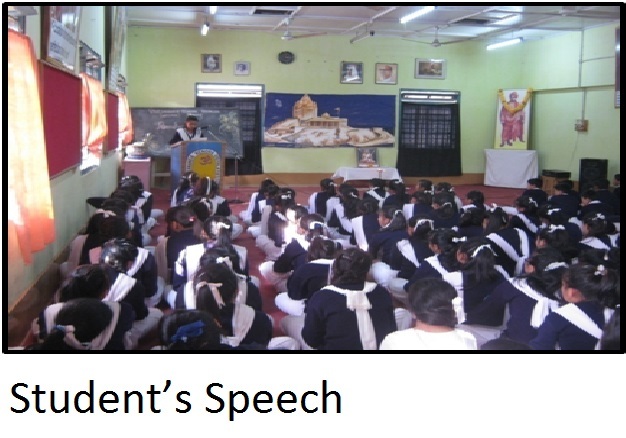 Sri Rupesh Singh, teacher of the vidyalaya delivered a speech followed by the speech of one student of class IX. The programme ended with a prize distribution ceremony. The students were very happy to receive the attractive prizes of their need and content to be recognized for show-casing their talent. It was a brief but successful programme. Republic Day was celebrated with a great enthusiasm. Almost all the students were present. 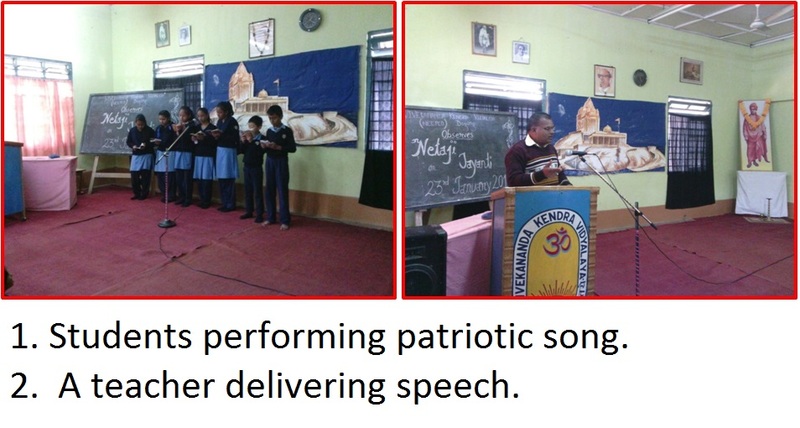 A group of students presented a patriotic song. Principal, Smt.Manisha Dey delivered a speech. The programme ended with a sweet distribution. 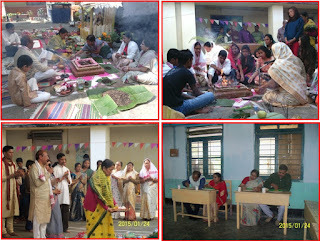 Sri Sri Saraswati Puja was performed with lot of enthusiasm and devotion among students. Parents and students took prasad after rituals were performed. All the NEEPCO, CISF officials and a large number of people enjoyed the community feast. 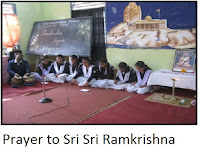 A bhajan sandhya was performed at school in the evening. 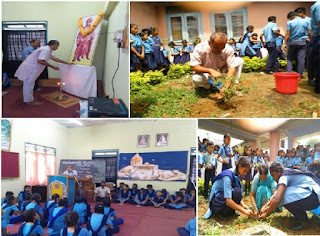 Geeta Jnana Yajna was observed in our school with different activities. Students of classes VIII to X participated in a discussion on Karmayoga slokas along with its explanation, under the guidance of Sri Rupesh Kr. Singh. The Importance of Geeta in Daily Life was explained by the students in the morning assembly in the regular basis. The teachers of our school Sri Vijay Kr. Upadhyay, Sri Rupesh Kr. Singh, Sri R.P.Suman and N.Borkataki also explained the importance of Geeta in Daily Life. Karmayoga Slokas of Geeta were presented in morning assembly. 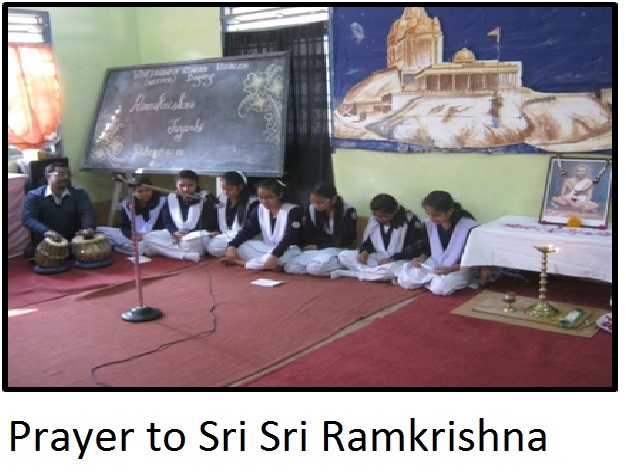 On 2nd December, 2014, Tuesday Geeta Chanting Competition was conducted for the students of classes LKG to X. On 23rd January 2015, Friday, Netaji jayanti was observed. Program started with mangalacharan and Desh Bhakti Geet was presented by the students. Sri R. P. Suman spoke on the importance of the Netaji jayanti. A student of Class VIII also delivered his speech on this occasion. 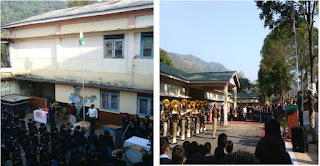 The programme started in the early morning .All the students of class X were present in the ceremony. Su.Reboti Didi chanted slokas praying for the welfare of the students and for their future. The serene atmosphere touched the heart of everyone present there. Feast was arranged after the rituals were over. The love and affection of all the lady teachers added extra flavours to the feast. On 18th February 2015, Saturday, Ramkrishna jayanti was observed. Program started with Mangalacharan and a student of class VI delivered the speech. A group of students presented a Geet (Ramkrishna Sharanam). Susri M.R.Talukdar, delivered speech highlighting the importance of Ramkrishna jayanti. The observation concluded by chanting of Shanti mantra. The ceremony was held on 22nd April 2015. Sri V.K Upadhyay performed the rituals. All the parents with their children were present to begin the journey of their academic career with high spirit. Everyone offered flowers at feet of Ma Saraswati. The ceremony ended after each child was fed sweet by Principal, Manisha Dey. On 11th May, 2015, Rabindra Jayanti was observed in the school assembly hall with due solemnity and grandeur. An assemblage was organised in the upper assembly hall in the afternoon at the last period. All the students from senior classes and the teaching staff attended the programme. It was started with mangalacharan by a group of students and at the same time our Principal Didi, Smt. Manisha Dey has lit the lamp. One of our teachers Smt. Mala Roy Talukdar has delivered a informative speech on the life of the great personality Kabiguru Ravindra Nath Tagore. Thereafter, our music teacher Sushri Arpita Puzari sang a Ravindra Sangeet which was melodious and heart touching. The school observed world environment day on 5th June, 2015. Sri Pranab Das Gupta and a sudent of class X delivered their speeches in this occasion. Quiz was also an activity in the programme. About 100 Tulsi plants were planted in different place inside the school campus. The plantation was initiated by Sri Praveen Da and Su. Rebati Didi. Su Rebati Didi spoke on the need of world environment day observation. A quiz programme was conducted in the school by State Bank of India to aware the students about banking on 30th April, 2015. A teacher of the school Sri Sucharit Nath was invited as Quiz Master and he was assisted by other teachers and made the contest a grand success. Students were awarded by the Br. Manager, State Bank of India, Doyang Branch. The programme was appreciated by the Bank Staff. Yoga camp for ladies for duration of 13 days was held from 30/01/2015 to12/02/2015. A total number of 35 mothers participated in the camp. Smt. Nanda Sahu, Teacher of VKV, Doyang conducted the Ladies Yoga session everyday in the evening hours. On the concluding day, Joint Secretary, VKSPV Su. Reboti Devi was present in the programme. Vivekananda Kendra Vidyalaya, Doyang organised a mass surya namaskar demonstration at the school premises on 13th February 2015. VKVs in the north east are celebrating the period 14 November 2014 to 14 November 2015 as Mananeeya Eknathji’s Janma Sati Parva. Eknath Ranade who was the founder of Vivekananda Kendra had a great vision of transforming Swami Vivekananda’s twin ideal of ‘Man Making and Nation Building’. The school taking along the society in its development has been organising various activities for the parents as well as students. The mass surya namaskar was participated by the CISF personnel of Doyang unit, the parents (mothers), teachers and students. About 300 people practised the twelve asanas of surya namaskar before the morning sun. HOP DHEP NEEPCO, Sri S K Dey was the chief guest on the occasion. Also present on the occasion was Asstt. Comandant, CISF, Sri V K Bist. Jt. Secy. VKSPV Su. 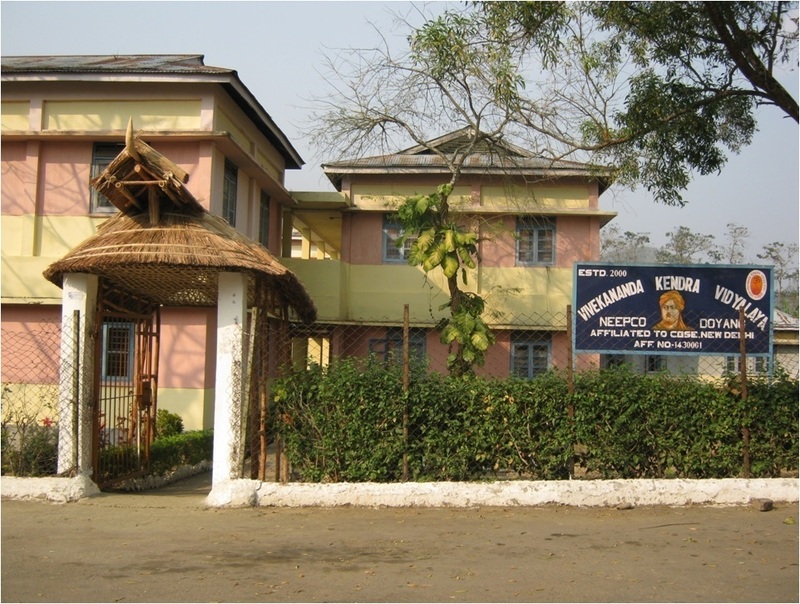 Reboti Devi briefed the activities undertaken by Vivekananda Kendra in the northeast. HOP NEEPCO in his brief address to the people appreciated this effort of VKV in strengthening the society through the abhyas of suryanamaskar. The programme ended with shantipath. Sri Ashok Kr. Sahu & Sri Rupesh Kr. Singh, Teacher of VKV, Doyang has taken up the activity of delivering speech by the students in morning assembly on different aspects of cleanliness drive and ‘Clean your surrounding’ campaign. Alumni Meet was organized on 3rd January, 2015 as a part of Yova Sanmelon. 36 ex-students were present in the meeting and they are given the lunch from the school side. In INTER SCHOOL SPORTS & GAMES COMPETITION 2014-2015 organised by the Ministry of Youth Affairs & Sports, Govt. of India. CBSE East-Zone Cluster – 1. Kho-Kho Championship for the students below 19 yrs, was held in NPS International School, Guwahati from 21st October’ 2014 to 22nd October’2014. A 25 member’s (Boys & Girls) team escorted by Sri Ashok Kr. Sahu (Physical Education Teacher) & Sri Sudhir Kumar (Librarian) participated in the Kho-Kho Championship. VKV (NEEPCO) Doyang delivered a fascinating performance and got first runners up trophy in girl’s category. Out of 25 students who participated in the event, 11 of them were selected for the National-Level which was held in Yaduvanshi Shiksha Niketan Mahendragarh, Haryana in the month of November 2014. It needs to mention here that this is for the second time students of VKV (NEEPCO) Doyang have qualified for the National Level games & sports. Won first runners up trophy in girl’s category.